An article published in International Journal of Advance Foundation And Research In Science & Engineering, on March 2015. Limited work has been reported on thermal & pressure stresses developed in welded portion of pressure vessel as well as in wall of the pressure vessel. Upto most of the literatures works on analytical solution to determine the stress distribution in a multilayered composite wall pressure vessel subjected to an internal pressure and a thermal load, based on thermo-elastic theory. In the solution, extra pressure was proposed to emulate the effect of the whole closed ends of the pressure vessel. To validate the analytical solution, the stress distribution of the pressure vessel was also computed using finite element (FE) method. It was found that the analytical results were in very good agreement with the computational ones, and the effect of thermal load on the stress distribution. 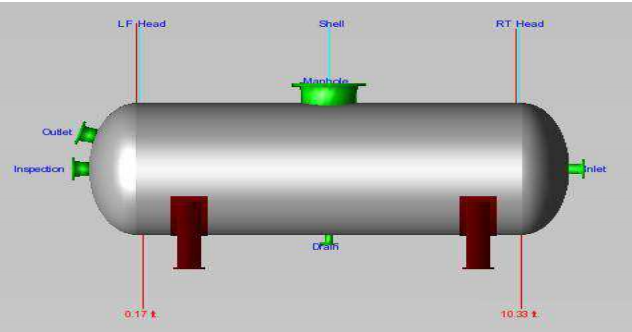 The proposed analytical solution provides an exact means to design composite pressure vesses and investigates ultrasonic method in stress measurement through thickness of a pressure vessel. Hoop and axial residual stresses are evaluated by using different frequency range of ultrasonic transducers analyses it for longer life. Ce contenu a été publié dans Publications par geraldb17, et marqué avec analytical solution, multilayered composite, Pressure vessels, stress distribution. Mettez-le en favori avec son permalien.